At ServiceMaster Cleaning and Restoration Services, we understand how difficult it is to lose your property and valuable items to a fire, which is why we provide quality and effective fire restoration recovery services. We can begin as soon as the fire is extinguished, starting with the cleanup of the effected area and working until your home or office is fully restored. Using effective procedures with our top of the line equipment, we can restore your business or home quickly. During a disaster, ServiceMaster Cleaning and Restoration Services also provides content cleaning, packout services, and board up services. 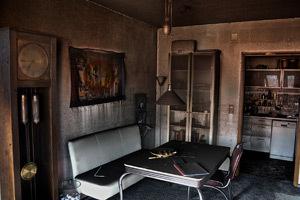 Content cleaning is exactly what you think it is, during a fire when your valuables are covered in soot, ash, and dust, our experts will clean them thoroughly to remove the contaminants and avoid permanent discoloration or odors from settling in. When your property is heavily damaged and you need to store your valuables, furnishings, and other items, ServiceMaster Cleaning and Restoration Services offers packout services. Our team of restoration experts will inventory, pack, and store your belongings in our secure warehouse until you are ready to retrieve them. Also if you have any unsecured openings within your property from either broken windows, broken doors, or damaged structures, our team can provide temporary security and relief with our board up services. ServiceMaster Cleaning and Restoration Services technicians will seal and cover all openings to provide temporary protection against the elements, intruders, and critters. For more information about fire damage restoration and how we can help provide assistance for your belongings and property, contact the ServiceMaster Cleaning and Restoration Services office today for more information.